The Djiboutian navy has just received two high-speed maritime patrol boats courtesy of the United States Department of State. The gift was made in an effort to strengthen the maritime security capabilities of a key African coastal state. Djibouti is located right on the Mandab Strait, which connects the Red Sea to the Gulf of Aden. As ships travel east from the Mediterranean, they must pass through the Suez Canal, the Red Sea, and through the Mandab Strait to the Gulf of Aden and beyond. As this route has recently been plagued with pirates, the world community has looked to some of the key East African states to bolster their maritime domain awareness. 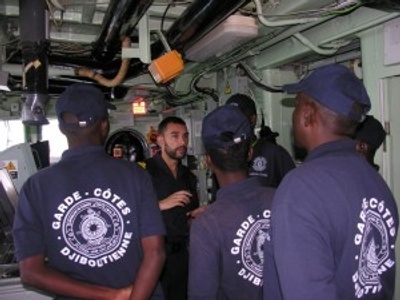 At a transfer ceremony, several Djiboutian sailors received certification to operate these state-of-the-art boats. Aside from these patrol boats, Djibouti has recently upgraded their shore-security apparatus. The country has implemented a Regional Maritime Awareness Capability system with radar-like features that can cover the water up to 12 nautical miles offshore. In addition to that, Djibouti is also adding an Automatic Identification System that can identify ships and query databases for important information about the vessel, cargo and crew. The range of this system is up to 100 nautical miles. Much of Djibouti’s economy centers around maritime activities, so these measures will go a long way to help domestic, as well as foreign concerns. But obviously, Djiboti’s key partnership in the region with the United States is the primary reason for the gift. Surrounded by states that have traditionally encountered much instability — Yemen, Somalia and Eritrea — Djibouti can play a leading role in combatting the far-reaching effects of chaos — if they have the capability. For that reason has the U.S. continuously stressed their commitment fostering a strong partnership between the two countries. While international navies have played a significant role in the reduction of piracy, defense budgets worldwide are shrinking, and it may not be possible to station a nearly permanent international fleet in the Indian Ocean. It is clear that the ultimate solution to the problem is stability for the countries from which it originates — in this case Somalia — but in the mean time, increasing the capabilities of countries in the region will take some of the pressure off of the international fleet at sea.